Fostering community and providing amazing experiences. It’s a commitment to Jimi’s presence in this world. Treat others with dignity and kindness. Be a good friend. Travel the world. Learn lessons from other cultures, and bring them home. Foster community. Be good to the land and the harvest it bears. Have fun and truly live life. We honor these intentions daily in our Tasting Room in simple ways. Treat our customers with kindness. Provide exceptional experiences that attempt to teach and educate not only about wine, but about our commitment to the land. Foster community with regular events like Pizza Fridays and BINGO night. Provide paid volunteer time to our full-time employees. Toast good friends, whether here or passed. Smile. We are proud of the way we make wine, treat our customers, and provide stewardship of the land. 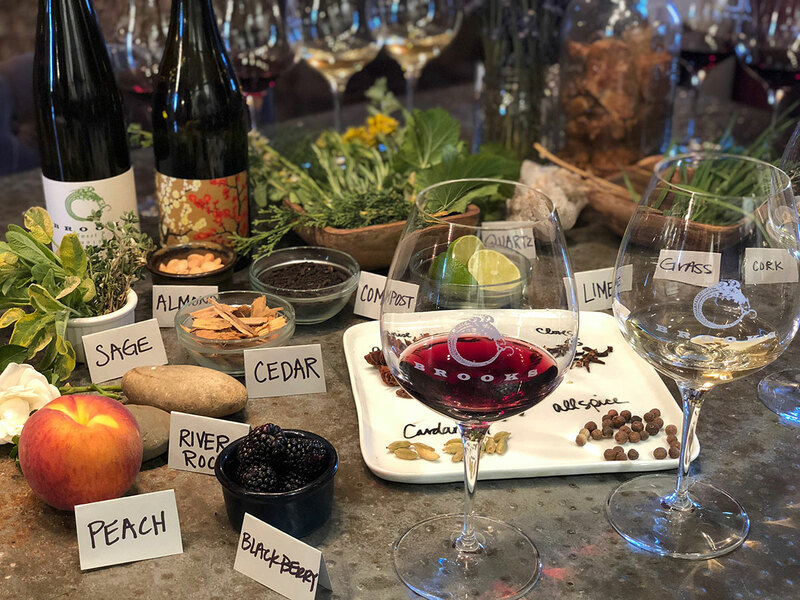 Part of that commitment is creating amazing experiences for our customers and providing education across everything we do: Wine, Vineyard, and Culinary. It is for this reason we have expanded our Brooks University offerings. Please browse the four course levels below. If you attend one experience from each level, you’ll be invited to our first ever Graduation Party at the end of the year. Join us for a FREE behind-the-scenes tour, daily at 11:30AM. A Brooks Education Specialist will guide you through our production facility and barrel room so you can see where all the magic happens. Visit our beautiful tasting room to sip and savor a flight of six of our currently released wines (whites, pinot noirs, or mixed). Our knowledgeable and friendly team will serve you table side and ensure you have an wonderful visit. Delicious food and snacks will be available for purchase to enhance your experience. We invite you to sit back, relax in our comfortable setting, take in the views of Mt Hood and other Cascade peaks while you enjoy the wines at Brooks. Reservations required for parties of 6 or more, please email dayson@brookswine.com. Do you ever feel intimidated by wine? Whether it’s ordering at a restaurant, going to a Tasting Room, or drinking with “wine knowledgeable” friends, for some reason we can all get a little worried. At Brooks, we hate hearing things like that. Wine is supposed to be fun. Wine is supposed to relieve stress, not cause it. We’re here to help with our new Wine 101 Class: See, Smell, Sip. Join Brooks’ Executive Chef for a hands-on cooking class each month. Wines are always paired with the class and you’ll get to eat your creations! Learn the principles of biodynamics and to what extent we follow that on the garden end (soil prep, compost production, etc). Barbara will also teach on integrative planting for soil development, water conservation and pest reduction. She will also discuss garden designs that reserve space for deer and other wildlife, while also protecting kitchen crops. At the conclusion of the class you’ll be able to select produce to go and enjoy lunch and a glass of wine on our lower patio. We look forward to sharing this special experience with you. 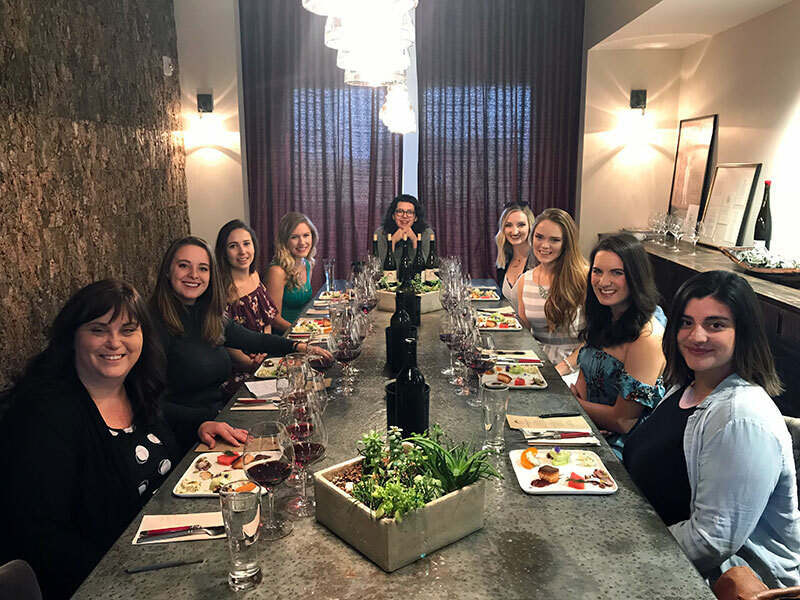 Your personal hospitality guide will share the history of Brooks Winery and the Oregon wine story while taking you on a tour of our beautiful winery and gardens. In addition, You will experience a seated tasting with a special selection of our limited production single vineyard wines along with special library and winery only offerings. Our Executive chef will pair charcuterie, cheese and other provisions to match the wine selections. Hop into our Brooks all terrain vehicle and head out to our Estate vines. Explore different blocks, learn the history of the vines and drink Estate wines from the grapes that surround you. Your Brooks host will share the lifecycle of a vine and update you on the observations of the current vintage. You will be immersed in some of the oldest pinot noir and riesling vines in the Willamette Valley. Return to the winery, take in the views, and enjoy a complimentary glass of wine. 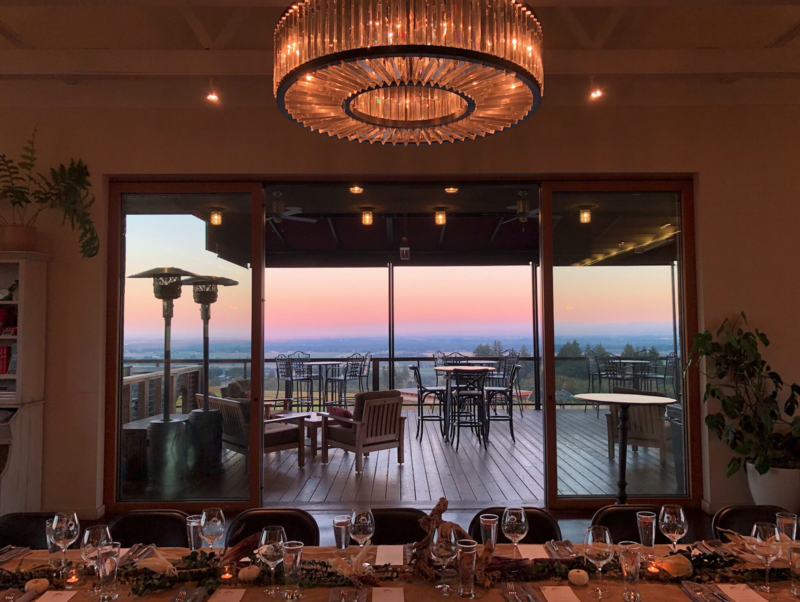 A wonderful series of dinners crafted by our executive chef, Norma Buchholz, these three dinners will feature the best of Brooks wines and local produce and meats and seafood. As you know, we make a lot of Rieslings. But, have you ever wondered why? You see, because we source grapes from a variety of vineyard sites, we’re able to capture the unique terroir of each, and let the full expression of each site come to life. Now you can experience where that happens and how it’s done! You will visit three different vineyards with three different soil types, while tasting the Riesling that we produce from that site. Assistant winemaker Claire Jarreau, and Lauren Williams, will be your guides as you enjoy a day off the beaten path and see what goes into our single vineyard Rieslings. The tour includes transportation, wines at each stop, a lunch prepared by our chef, Norma Buchholz, at the end of the tour, and a sample of our Sparkling Riesling. Please wear appropriate clothing and footwear, bring sunscreen if it’s a sunny day, or rain gear if it’s a rainy day, as we will be out in the vineyards. More details and itinerary will be available soon. Join us at the Chehalem Cultural Center in Newberg, for the Brooks University Master Class. During this seated seminar, we will be featuring Wine Writer Patrick Comiskey, from Wine and Spirits Magazine and LA Times. There will be food available, wine and a book signing by Patrick and his award winning book American Rhône.